Ooh, la, L.A.! Since Valentine’s Day is right around the corner, this post goes out to one I love: my new home of Los Angeles. Plus, I’m sharing some swoon-worthy fashion to get you in the mood for Valentine’s Day, whether it’s date-night or girl’s night out, wherever you are. SHOP THE LOOK: PARIS MEETS L.A. 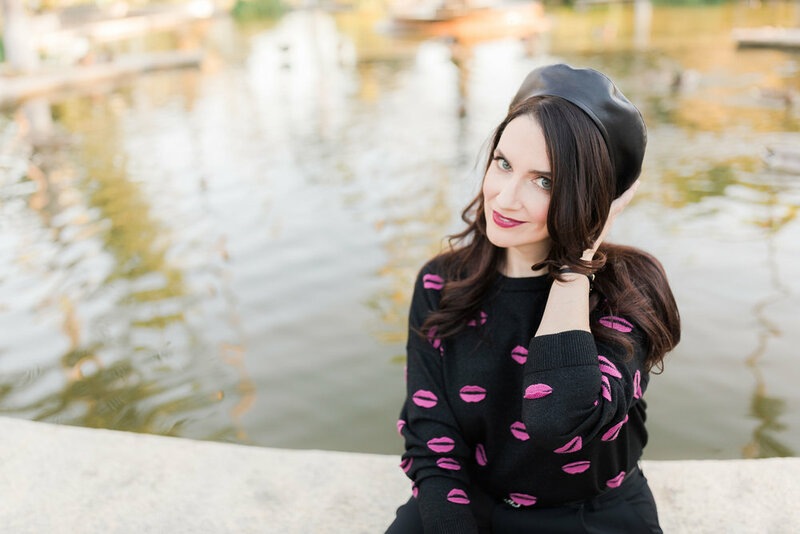 If you read my last post all about how I found that creative spark once I took the leap to move to Los Angeles and launch my blog, you know I’m crushing hard on the creative city for all I’ve been able to make happen here. Not only is it a stylish city where bloggers and actresses strut their fashionable stuff day to night. It’s the perfect backdrop to wish upon the stars and see your dreams actually take shape with plenty of opportunity for artistic collabs and more instagrammable moments than you can shake a selfie stick at it. When I drive by that infamous pink wall on Melrose it’s not hard to remember why this city is where content comes to life. It’s all right at your fingertips. With every blog post I see myself living out dreams and visions and ways of seeing myself that I never imagined. And I love how the backdrop here can change as a readily as a movie set. Take this photo shoot, where we stumbled upon a park that felt like a little slice of Europe, with meandering sidewalks that lead to a stone fountain at its center and plenty of benches to watch the ducks paddle by. This Alice + Olivia ensemble of chic black pants and playfully embroidered sweater topped off by a Eugenia Kim leather beret is easily apropos for springtime in Paris or New York. But a mostly black look of trousers and a sweater and can still have its moment in the sun in Los Angeles where winter and spring temperatures are perfectly accommodating to cool weather outfits this time of year. Paris may be the city of Love, but at the moment, Los Angeles certainly has my heart. Of course I’m wondering if the “romance” will endure here in L.A. but for now I’m fine just basking in the glow of what’s to come. Happy Valentine’s Day!